This Loaded Bloody Mary Cocktail is a full meal! 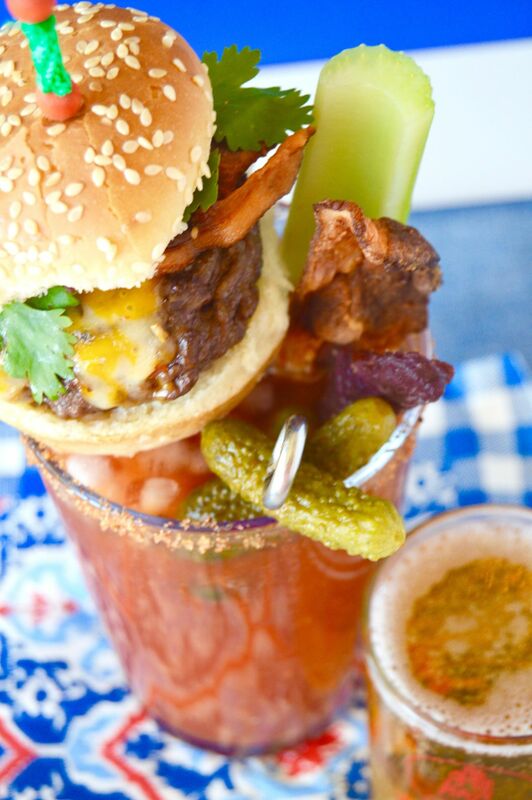 Spicy Horseradish compliments the tangy tomato base and its topped with all the foods you want to eat when drinking a Bloody Mary: a burger, beef stick, bacon, olives, chunks of cheese and a Celery Stalk! Perfect for a brunch or watching a game! In continuing with some of my takeaways from my trip to Minnesota I thought I’d talk about Bloody Mary’s today, specifically a Loaded Bloody Mary! I love this drink. It works for breakfast, brunch, football Saturday’s, on the golf course. Yes, pretty much anytime. In Minnesota they do a Bloody Mary right. Instead of just a lonely piece of celery, they serve it with just about everything. A mini-cheeseburger, a beef stick, anything pickled (artichoke hearts, green beans) an onion ring, a whole pickle, olives, pepperoncini’s and of course in true MN fashion, any number of cheese cubes. They don’t just put one thing in them, they put at least 5 in every drink. It’s fantastic, I always feel like I’m getting served an appetizer to go along with my Loaded Bloody Mary. Small pour of beer equals what they call a snit in Minnesotta! But that’s not all…..they also serve it with what they call a snit. 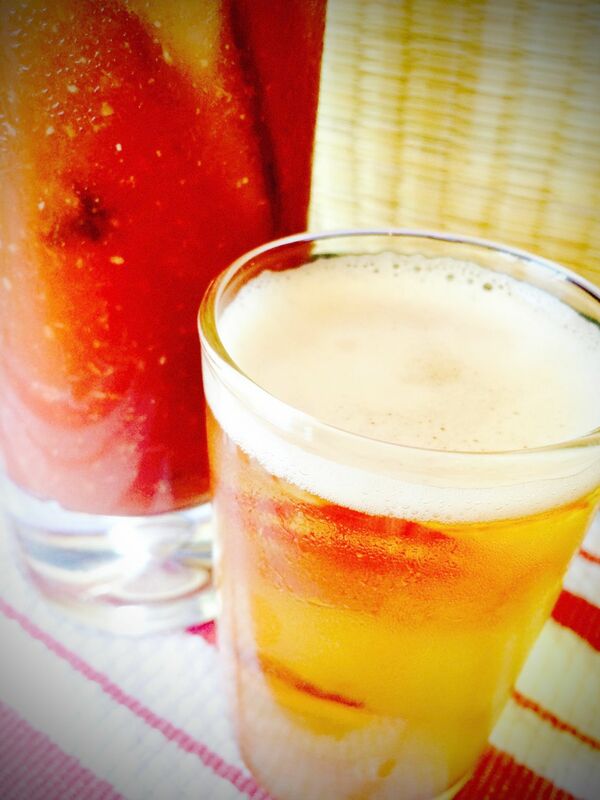 A snit is a beer chaser to go with your Bloody Mary. It’s typically a 3 ounce pour in a small glass, but in Minnesota I’ve actually been served a pint glass as a chaser with it. Snit’s are common anywhere in the upper Midwest. So if you order one in California they won’t necessarily know what you’re referring to. The history of the Bloody Mary isn’t clearly defined. Some say a bartender from the famed Harry’s Bar at the Paris hotel first made it. Another story has a bartender from Harry’s coming to a NYC bar and creating it(where it is referred to as a Red Snapper) and other’s claim it’s a cocktail made to represent Queen Mary (the red being the bloodshed in her life.) What is agreed upon is that they are delicious! Look at that yummy Horseradish spicing up the Loaded Mary!! They are very simply made. All you have to do is stir everything together in a glass. It’s easily altered to a spicier drink with more Tabasco or horseradish for those who prefer(me, me, me) I personally like having a salted rim, which pairs perfectly with the tomato juice’s acidic tang. Most people use celery salt, but I’ve found mixing celery salt with Lawry’s seasoning salt gives a little sugar in the first taste which is delicious. 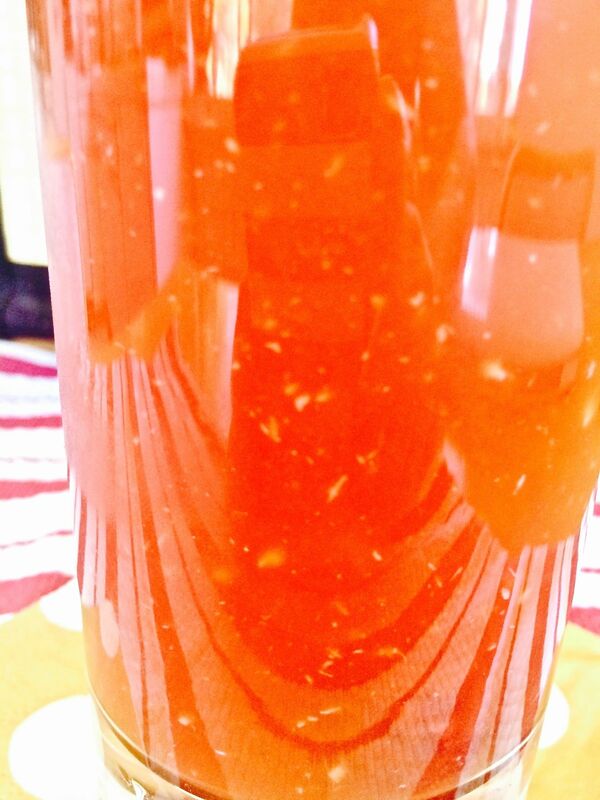 There is a secret ingredient that makes this Loaded Bloody Mary incredible!! And did I mention my secret ingredient? Bacon, yes I said bacon. That magical ingredient that makes everything better. Try it, you won’t believe how refreshing and well rounded this loaded bloody mary is! Other bacon add ins include this Bacon Popper recipe here or a bacon wrapped meatballs like this recipe! When you want to make an impression at a get together, these Bloody Mary's with the works are the way to go. Bacon, cheeseburgers, olives, cheese, you name it, it can go along side your cocktail. Simple to make, just serve a buffet with them to have your guests make it up the way they like them. The ultimate bloody mary!! Mix the two salts for the salt rim and place on a small plate. Take a lime wedge and run it along the rim of the glass, then dip wet edges thru the salt to coat rim. Add Vodka, Tomato Juice, crumbled bacon, Worcestershire sauce, Tabasco, horseradish and shakes of celery salt over the ice in the glass. Have separate containers with all of the add ins for your guests to be able to add in what they like into their drinks. You can also mix up a pitcher and have them only adjust their drinks with the tabasco. High Ball glasses are the traditional glass for these drinks. Calories do not include accompaniments, such as cheeseburgers, olives, beef jerky etc. « Must Make Mac n Cheese Recipes you have to try! I love how this worked so well for a Bloody Mary bar…. we had hot dogs, mini corn dogs and all sorts of things and people loved them! Is it wrong that I want to make these again for Easter? It might make spending time with my crazy relatives a LOT more fun! Yep, this is how we do it in Minneapolis, and I think you should visit soon! Wow! This is like the Bloody Mary to end all Blood Marys! I can’t believe there is a burger on top? Who needs brunch? I’ll just have one of these 😉 Looks so yummy! Really refreshing. I feel like preparing this one right now. I must say, I never have had anything *in* a Bloody Mary but celery – in New York, it’s generally a brunch drink. (I don’t think I’d better put Eggs Benedict in one, do you? Messy… ) But I can really see that at a buffet! Solves the “I need at least three hands!” problem. My husband is from Minnesota! I’m going to show him this post when he gets home — I have a feeling I know what we’re making this weekend! What A small world Lisa, thats where my husband is from too (thus why we go there for summer vacations)… Cheers! OMG a mini burger on a drink, I am in heaven. Bloody Marys are my spirit drink! Vegetables and vodka. There is nothing better. I love the mini cheeseburgers! That is breakfast and lunch all in one glass. I am going to make two so I can have it for dinner too! Wow Michele. You’ve somehow managed to cram in so many interesting facts about the Bloody Mary – almost as many facts as edible additions when ordered in Minnesota. I always like a bit of foodie history, so thankyou. I think I’ll take mine with cheese cubes thrown in because, well…. cheese & tomato. I have a confession, I’ve never even tried a Bloody Mary before! I just love how loaded up this is though, a cocktail that’s also a full meal is my kind of drink! Looks amazing! I absolutely love a good Bloody Mary! I agree bacon is a must. I love that yours comes with the mini burger. I need to try recreating this! Thanks! Out of all the drinks I’ve had before, never tried a Bloody Mary before. I’m intrigued that you made one with bacon. Okay, now that is a bloody mary! I am from Minnesota, but I haven’t tried these yet! 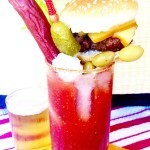 I can’t say that I have ever seen a burger as a garnish for a drink. That is pretty cool! It definitely looks like a whole meal to me! I love a good bloody mary! I remember my first one – I was the best hangover cure ever! ha! Now I’m craving a bloody mary! Lol! This looks delicious! I think bacon makes everything better! This is a perfect drink to try this summer! Woah that is incredible! You are literally getting a full meal with your drink! Yes! They really know how to do it right in MN! Wow! I have never seen something like this before! An entire burger on the top?! Genius! This definitely will go down in my books as something to try. Wow. I’ve never seen a drink topped that way. I love the two in one idea. Great for a party. wow, are you kidding me right now? I’ve never seen something like this before, how fun. Great novelty idea. Wow! I have never seen anything like that in my life! A burger instead of an olive is so unusual. Would love to try one. Great post! My husband and I were just discussing offering a bloody mary bar at our Easter brunch! These add in’s are so different from what we usually add. Will have to give some of them a try! That’s a seriously loaded bloody mary. It’s practically a meal. I keep staring at the burger bun. Ha! That is quite a drink. A full meal in a glass it seems. This is insanely perfect and so different j love it !! Bottoms up. I had no idea the Bloody Mary had such a history. I always wondered who invented it. What a fun post! I would never have thought to put this together in such a creative a delightful way! I am nearly 35 years old and I have never had a bloody mary! Looks like I better change that! That sounds really good. I haven’t had a bloody mary in forever, but I think I need to make myself one of these ASAP! Great post! I’m thirsty and hungry!